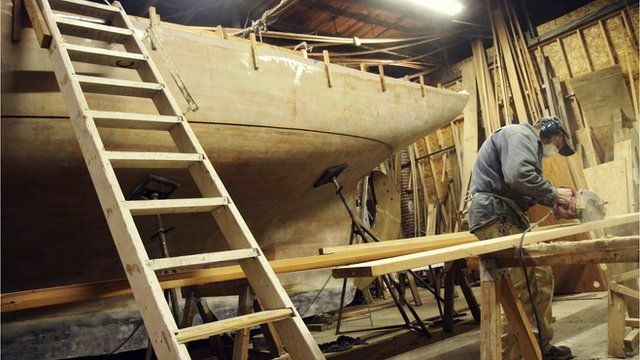 In his warehouse in Philadelphia sits Jonah Eaton's 42ft (13m) wooden boat. Over the past eight years Eaton has devoted much of his life to building the vessel by hand, with scores of volunteers helping along the way. The project started off as a rough idea - Mr Eaton's parents would buy the lumber and he would provide the labour. None of them could foresee how consuming the boat would become. But building a boat was only part of the plan. Eaton and his parents hope to sail it across the Atlantic Ocean and end up somewhere in the Mediterranean Sea. The project is a labour of love and the latest subject of the BBC's Big Dreams series.